BOSTON, MA - OCTOBER 02: David Ortiz #34 of the Boston Red Sox tips his cap to fans during the pregame ceremony to honor his retirement before his last regular season home game at Fenway Park on October 2, 2016 in Boston, Massachusetts. David Ortiz has a new Christmas sweater out, but you might not want to wear it around the kids. The sweaters and shirts say "This is our ... Christmas," with a partially obscured naughty word that refers back to the Red Sox designated hitter's speech following the Boston Marathon bombings. The design also includes an image of Big Papi with sunglasses and a Santa hat. 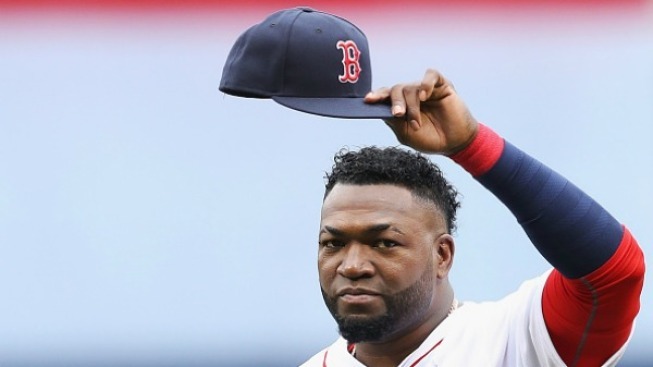 The shirts are being sold to raise money for the David Ortiz Children's Fund, which helps kids with congenital heart defects get life-saving surgery. They come in three colors and four styles.